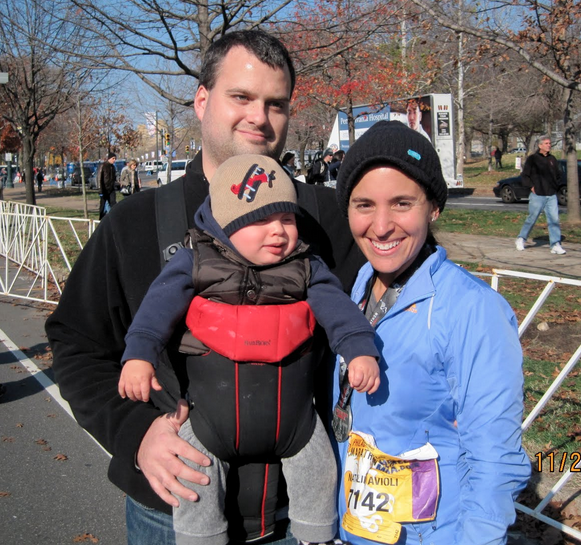 When I became pregnant with #1, I was an avid runner! My first marathon was when I was two years out of college, and I did a few more before having kids along with some half marathons and my favorite distance – 10-milers! I used to run 7 miles most days before school to start off the day like it was clockwork. I was in great shape and 7 miles was nothing at that point! (Now 7 miles is a long run :/ ) I started my blog when I was newly pregnant with my son, and ran through the pregnancy while training for the Boston Marathon which was 2 months after my due date! The first time it was easy. I still remember a colleague telling me I wouldn’t be running marathons after I had kids – it infuriated me! And I found it easy to keep up my running while not working with just one child, and kept doing marathons after having my second and still enjoyed it! I was in my best shape when #2, baby Kara (named after Kara Goucher) was 1 year old and completed my first 2 triathlons for some variety. I was really into biking and realized I might even like it more than running! I also signed up for 2 marathons that year hoping to get a best time at one of them and legitimately train when I found out 3 months before the first one that I was pregnant again! I ended up running the two marathons anyway – and those were the last 2 that I have completed. 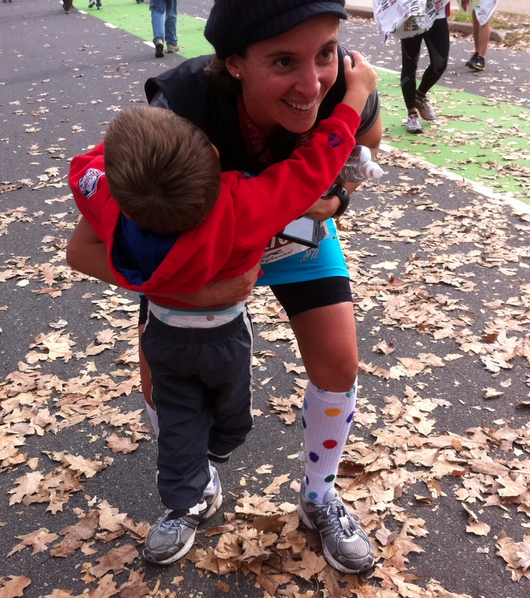 I have one great regret from finishing that last one – I wish I had grabbed my kids and ran through the finish with them. Have you ever done it? They would have loved it. I hope I can do that one day. I was so tired and delirious, I wish I was thinking straight. After #3 and a tough baby, I couldn’t find as much time to train, I started running way too soon after (ran a 10-mile race 10 days after #3 was born), became injured and lost steam. When she was around 5 months old, I discovered with help of a friend studying to become a trainer that less is more. I didn’t need to work out for an hour at a steady state to see results. In fact, that one hour at the same pace most days wasn’t doing much for me. High intensity shorter workouts were even more effective than longer steady state workouts. I felt awesome! I was running less but still fit. I managed to have an awesome run at a half marathon last fall without training much at all. My fitness level was at a good place – and bring on pregnancy #4. Almost 4 months out now, I am getting back into those shorter higher intensity workouts while incorporating foam rolling and lacrosse ball rolling to stretch and work out my muscles to prevent injury as I age! My runs are 4 miles max – and although I might enjoy a long run with a friend or my sis outside, I haven’t done it in a long time! Since my time is limited, I am not all that motivated to spend hours running. I signed up for the half in Philly on Halloween, but I’m not sure my fitness level is there yet. I might have to sit that one out. And I’m not sure that I’ll have the desire to do another half in the near future. I’m looking to May and hoping I’ll be in decent shape to do my favorite 10-miler! Unite Fitness Online provides weekly workouts sent to your inbox! I try to do one a week but these are on the longer side. Blonde Ponytail provides strength work and circuits on her blog that I love to do almost every day. They are short and sweet! How about you? Do you prefer shorter spurts or longer runs? More cardio or more strength? Writing this made me want to do another marathon 🙂 How about you! 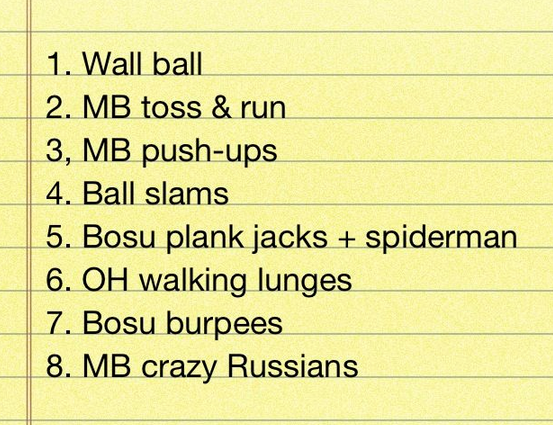 Nowadays, I’m all about short, higher intensity workouts! I used to just run all the time and do nothing else. At this point with three young children though, I don’t have the time or drive to run as much as I used to. I am a bit burnt out on running after two half marathons in the past few months.